#1 New Hampshire This New England state is loaded up with costly private schools. Dartmouth costs over $55,000 per year, making it the 13th most costly in the country (and the 11th best)! But it’s not always the most costly schools that have the most debt per student. It depends on how much non-recoverable student financial aid is available and the amount students contribute to their educational expenses. 75% of New Hampshire’s students graduate owing student loans and these average a whopping $32,440. #2 Pennsylvania Pennsylvania students graduate owing nearly $30,000 on average and 70% of graduates come out owing debt. Carnegie Mellon, Villanova, Bryn Mawr and Lehigh University each cost more than $40,000 per year, so perhaps graduating owing less than one year’s worth of tuition seems a comparative bargain, but the monthly cost to pay off this student loan over 10 years will run close to $345 per month. #3 Minnesota Tiny Carleton College in Northfield, Minnesota matriculates less than 2,000 students at a time, but at a huge cost per student of close to $55,000 for their liberal arts program. 71% of graduates in Minnesota will owe student loans and these will average $29,793. But the state average pales by comparison when you consider the debt of graduates by college. Alumni of the Minneapolis College of Art and Design owe $43,035 on average and 85% graduate owing. #4 Rhode Island Students in tiny Rhode Island owe big student loan debt. 69% of students here graduate owing an average of $29,097. Rhode Island graduates also have the second highest student loan default rate in New England – second only to Maine. The costliest college in Rhode Island is Brown University, followed by the Rhode Island School of Design and Providence College which all cost more than $54,000 per year. #5 Connecticut 64% of Connecticut graduates leave college owing student loans. This debt averages nearly $29,000. Trinity College in Hartford, Connecticut is the 11th most expensive college in the US with total tuition of $55,450 for each of its 2,300 students. If this is your school, at least the debt you’re racking up is worth it. Not only does Trinity offer a 10:1 student-faculty ratio, but faculty, not graduate students, teach all of the courses. #6 Iowa Students in the Midwestern state owe an average $28,753 and 72% graduate in debt. #7 Ohio Students in the Buckeye State graduate owing $28,683 and 68% of alumni have student loans. 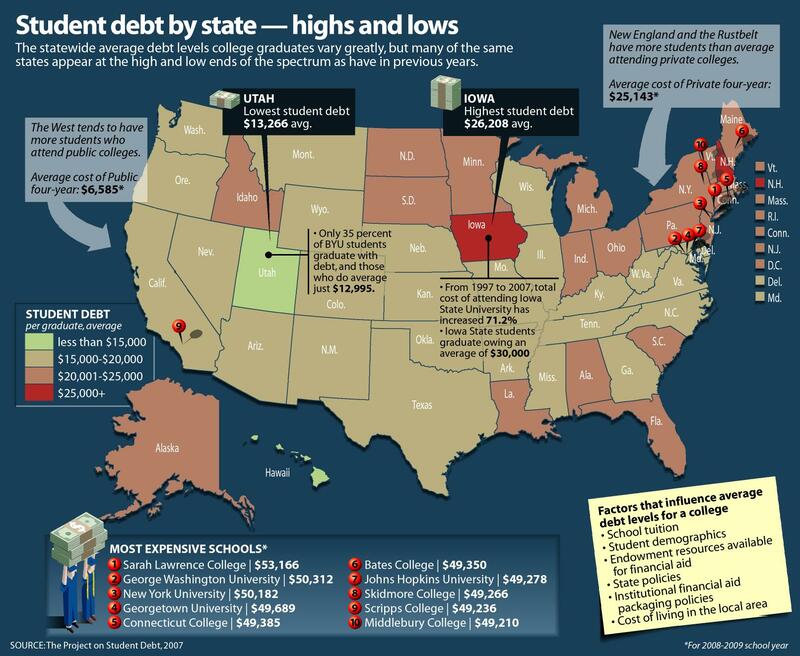 #8 Vermont It’s back to New England to find 63% of graduates in debt owing an average of $28,273. #9 District of Columbia 52% of graduates in the Capitol City owe student loans that average $28,241. #10 New Jersey Rounding out the top 10 is another Northeastern state where 64% of alumni owe, on average, $27,610. Within the states, for-profit colleges produce graduates owing more debt and usually with higher loan default rates. Surprisingly, Ivy League colleges have reasonable debt levels, with Harvard and Yale graduates having comparatively paltry student loan levels of just $7,700 and $10,476 respectively. The Project on Student Debt has prepared an interactive map you can check out here to see what debt loads are like in your state. For your specific college – or any college you’re considering – check out the recently launched College Scorecard which reveals college costs, average student loan debt, default rates and more information on overall affordability of an institution. Whether you are in college and beginning to borrow to finance your education or a graduate trying to figure out how to best manage your total student loan debt, check out Tuition.io’s free tool to help you organize and manage your debt to keep you on track!